World Language Initiative - Montana: Support world language education in Bozeman with Bozeman's Cosmica Boutique during Give Big May 3 & 4, 2018! 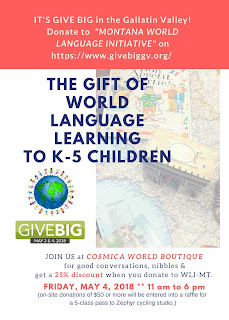 Support world language education in Bozeman with Bozeman's Cosmica Boutique during Give Big May 3 & 4, 2018! 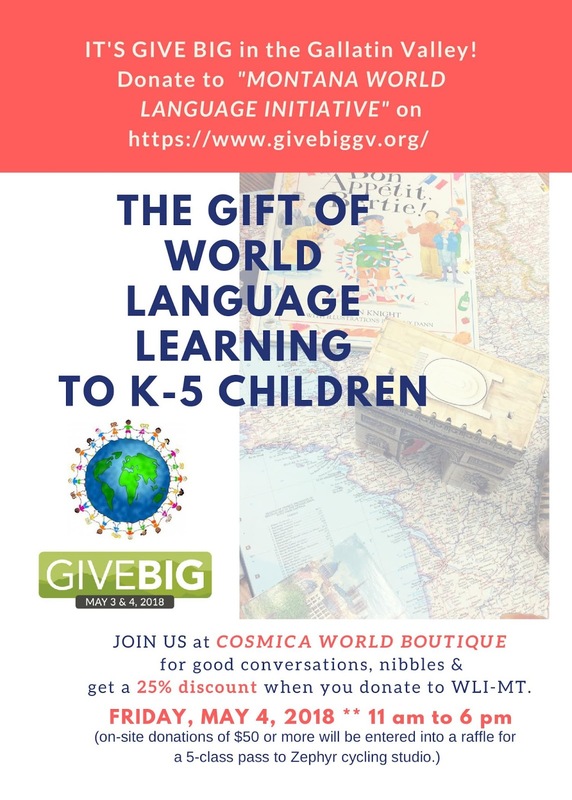 World Language Initiative - Montana (WLI-MT) is being hosted by Cosmica Boutique in downtown Bozeman for Give Big 2018. Come to the boutique between 10am and 6pm on May 4th, donate in person and receive 25% off any item in the store. If you donate in person at Cosmica $50 or more, you will also be entered into our WLI-MT Give Big raffle for a 5-class pass to Zephyr Cycling Studio. Thank you Zephyr Studio owner, Carolyn Williams.